Heat pumps are devices that operate to transfer heat in a fluid, liquid or gas at one temperature to that of a fluid at a lower or higher temperature. The name “heat pumps” was coined to describe its original use of carrying heat from a lower to a higher temperature. However, these pumps can be inverted to carry heat in the other direction. In summary, the heat pump can work both as a heater and as an air conditioner. The heat pump consists essentially of a closed loop through which a refrigerant flows. This fluid can be in a gaseous or a liquid state depending on the temperature and pressure of the space through which it is flowing. There are two types of power sources for the heat pump. 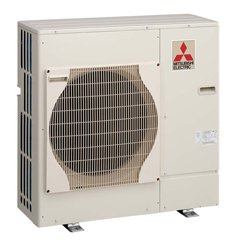 An electric heat pump consists of a compressor, condenser, expansion valve and an evaporator. During its operation, refrigerant flows to the compressor and changes from a gaseous to a liquid state and transfers its heat to the outdoors. This liquid cools when it passes through the expansion valve where it partially becomes a gas. It then absorbs heat from the evaporator where it transforms into a gas completely. It then passes to the compressor as a gas under low pressure is transformed to a higher pressure and in the process absorbing heat from the surrounding air returns to the condenser where it transfers the heat to the space where it is needed. Gas absorption heat pumps consist of a generator, an absorber, a condenser, a number of restrictors in series and an evaporator. During operation, the refrigerant flows from the generator, changes from a gaseous to a liquid state and gives out heat. It cools on passing through the restrictors and on to the evaporator where it evaporates in total and returns to the gaseous state. The refrigerant then moves to an absorber that returns it to a liquid state and moves back to the generator where it absorbs heat from a gas burner. Here the refrigerant is separated from the absorber through evaporation and the cycle repeats. Heat pumps are classified on the basis of their sources of heat and cold. Air water heat pumps draw heat from cold external air and transfer it, usually indoors, to heat a water circuit such as that used in standard central heating systems. Air heat pumps draw heat from the outside cold air and transfer it to a hot area and are used to heat the environment through fans, ducts or split systems. Water heat pumps can draw heat from an external water source such as rivers, lakes and the water table and transfer it to heat water indoors such as in central heating or under floor heating systems. Geothermal heat pumps are those that are used to tap heat from the water table. Water air heat pumps draw heat from the external water source and use it to heat the environment indoors through a series of fans, ducts or split systems.